Braided paracord bracelets are often seen in military circles. The bracelets use paracord rope woven in a decorative pattern and are worn around the wrist. There are several variations on the basic bracelet pattern. One way to modify the bracelet is to tie a dog tag to the cord. Weave the bracelet on either side of the tag to make a bracelet that looks similar to an ID bracelet. You can also weave a solid bracelet and hang the dog tag from the bracelet with a separate piece of cording. Punch a hole in the dog tag using a hammer and awl so that there is a hole on either end of the tag. Make each hold wide enough to fit two pieces of cord through. Cut the paracord rope in half to make two 5-foot pieces. Make a loop in the center of each rope about 4 inches long. 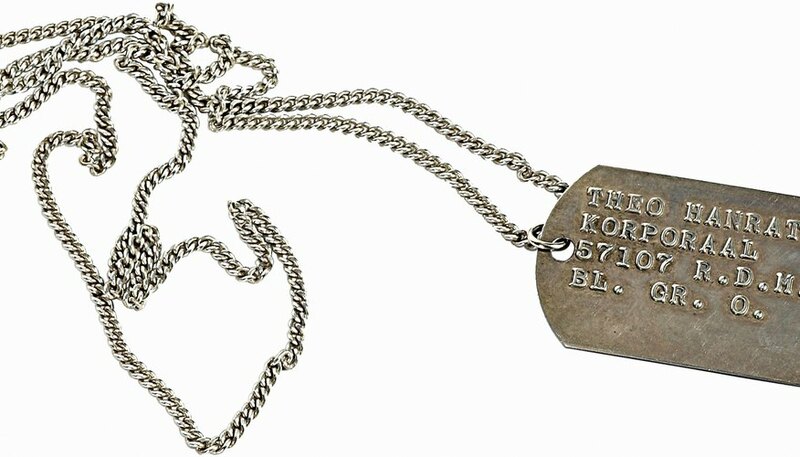 Tie the rope to the holes in the dog tags, leaving the loop hanging down from the center of the hole on each side. Make a small loop with the left side of one of the cords. Pass the string under the loop and make a second loop on the right side. Make a small loop with the right cord, then pass the cord through the left loop. Pass the rope under the left cord and through the right loop. Repeat this pattern to weave the cords to the end of the loop. Weave the other side of the bracelet with the same pattern. Pull the cords on the left side of the bracelet through the bottom loop to secure the cording. Cut the excess cords from both sides of the bracelet and apply nail polish to protect the ends. Sew a button to the left side of the bracelet. Loop the loop piece around the button to secure the bracelet around your wrist.